As expected, Apple has begun selling SIM-free unlocked versions of the iPhone 6 and the iPhone 6 Plus, over three months after the pair’s release. Since their launch, Apple’s latest flagship smartphones have been offered in the U.S. with a carrier contract on AT&T, Sprint, or Verizon, or unlocked and contract-free on T-Mobile. But now, they’re also available unlocked and SIM-free through Apple’s retail and online stores in the country. 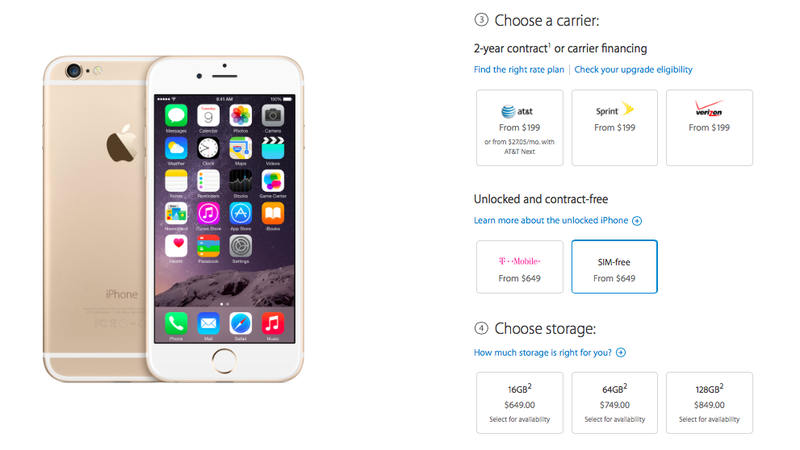 The pricing for SIM-free unlocked iPhone 6 and iPhone 6 Plus models are the same as that for contract-free unlocked T-Mobile units. For the 4.7-inch iPhone 6: $649 (16GB), $749 (64GB), or $849 (128GB). And for the 5.5-inch iPhone 6 Plus: $749 (16GB), $849 (64GB), and $949 (128GB). The SIM-free unlocked iPhone 6 model is A1586, while the SIM-free unlocked iPhone 6 Plus model is A1524. See also: Volkswagen to integrate with Apple’s CarPlay later this year, Apple to discuss financial results for first fiscal quarter of 2015 on Jan. 27, and As the Apple Watch launch gets closer, some unanswered questions remain.